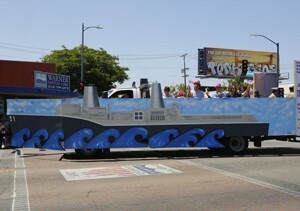 “Saluting the Price of Freedom” Floats, Music, People & Pure Fun! Canoga Park High Memorial Day Ceremony on the Memorial Quad. 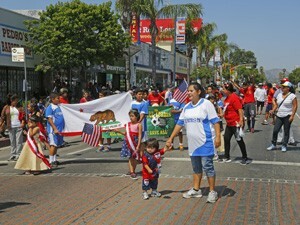 27th Annual Memorial Day Parade starting at Owensmoutth Ave. and proceeding east on Sherman Way to Cozycroft Ave.
A mobile patriotic show! The Parade welcomes businesses, Chambers of Commerce, Neighborhood Councils, and Community Organizations, to enter a float. If you are a business think about reaching out to a non-profit group and sponsoring their float! Brings a parade to life! Bands or choral groups may either march or ride. Help us with the music and reach out to your school, church, military and community organizations with bands. 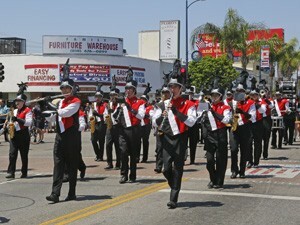 The music, whether vocal or instrumental, must be patriotic and consistent with the USA parade theme. Our pride is shown with every participant. People, young and old, marching or riding in the parade, all are a fitting tribute to the families who have sacrificed their loss for our freedom! Groups will have an opportunity to do a short performance during pre-planned parade stops along the parade route. Copyright © 2015-2017 Canoga Park / West Hills Chamber of Commerce.